The traditional dress code for the first event in the Melbourne Cup Carnival, today’s Derby Day, is supposed to be black and white. But frockwriter can reveal that VVIP guest Nicole Kidman will be adding a touch of green. Kidman’s publicist Wendy Day tells us that Kidman will be wearing a dress by American designer L’Wren Scott, a long-time Kidman fave (and the longtime partner of rocker Mick Jagger), and a hat by British milliner Stephen Jones. 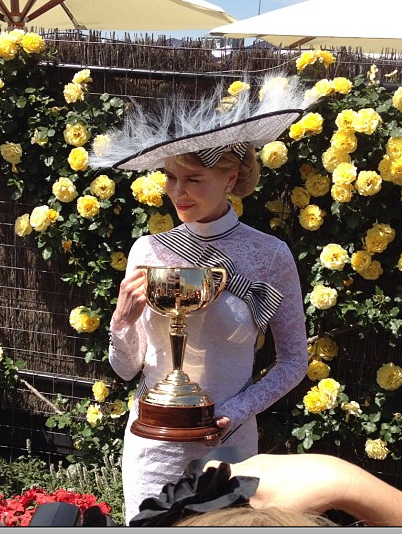 Day added that there is an “eco-friendly” aspect to Kidman’s Derby Day outfit. UPDATE: Kidman did in fact go with one of the original Green Cut outfits designed by Scott and Jones (pictured above, with the original dress below) - a shorter adaptation, as we predicted. Kitting out Kidman for the Derby was the latest coup for a sustainability project called the Green Carpet Challenge, which aims to inject eco-friendly and recycled materials into high fashion. And no mean feat, of course, for Melbourne-based wellbeing juggernaut Swisse Vitamins, which managed to coax Kidman to take a short break from filming Grace of Monaco in Europe to grace their marquee at Flemington for a few hours. Kidman was recently appointed a Swisse Vitamins global ambassador. Her race outfit was the fruit of a recent Green Carpet Challenge spinoff initiative called Green Cut. Unveiled at London Fashion Week in September (and sponsored by AmEx), Green Cut paired the British Fashion Council with the British Film Institute and challenged eight designers to come up with eco-friendly styles inspired by eight iconic British films. Jones was charged with re-interpreting George Cukor’s 1964 classic My Fair Lady – which is of course noted for its Ascot scene and a series of fabulous black and white costumes designed by Cecil Beaton, which earned Beaton two Academy Awards in that year's costume design and art direction categories. 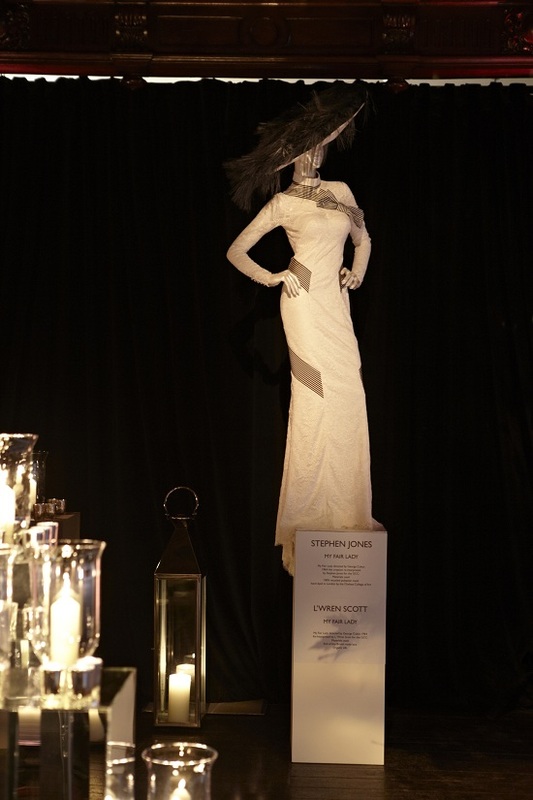 Jones' Green Cut hats were made from 100percent recycled polyester mesh, derived from plastic bottles and hand-dyed by the Chelsea College of Art and they were teamed with two gowns by Scott: one black, one white and both full-length (pictured below). According to eco-age.com, the white gown - which in every respect other than hem length is identical to the Derby Day dress worn by Kidman - was made from 52percent lace/48percent nylon with a 100percent silk ribbon trim and a silk satin underslip made from 98percent organic silk and 2percent elastane. The Green Carpet Challenge was originally launched in December 2009 by Livia Firth, an Italian-born documentary maker who is the founder of the London-based Eco Age retail concept/consultancy and the co-founder - together with her husband, British actor Colin Firth - of the online political/social film festival Brightwide. When Colin Firth was nominated for a Golden Globe for his role in Tom Ford's 2009 feature debut A Single Man, Livia was challenged by British eco journalist Lucy Siegle to come up with some environmentally-friendly/sustainable alternatives for what promised to be many tours of duty on his arm during the 2010 awards season. And she did not disappoint, making her red carpet sorties at events such as the Venice Film Festival and the 2010 Globes and Oscars in gowns fashioned from not just environmentally-friendly fabrics, but also scraps of "upcycled" fabric from luxury houses and even Colin's old Tom Ford suits. Now in its third year and embraced by a growing support base of major brand names and Hollywood stars, the Green Carpet Challenge saw Meryl Streep collect her Best Actress Oscar for The Iron Lady earlier this year in Lanvin's first ever custom-made eco gown. To the same Academy Awards, Livia Firth wore a red Valentino gown made from polyester recycled from plastic bottles.